Holly is eager to learn how to use her Canon XT better and eliminate blurry photos! Last week Holly called me, as many people have, to say she has a DSLR, but has only been using it in auto-mode. This is of course a tragedy that can easily be remedied with my DSLR Photography Lessons. In fact, Holly signed up for the discounted 4-pack of lessons. This morning was the first of those four. She bought a used Canon XT a little while ago, but as mentioned above was only using it in auto-mode and not getting consistently sharp images. I started the lesson by showing her step by step how to change the settings necessary for getting off auto-mode. I also explained a few common photography terms and how they relate to certain types of shots. With just a little bit of knowledge about aperture, ISO, WB and focus modes, one can begin to take control over the camera and thus take control over the outcome of one's photographs . . . and a DSLR wants to be controlled, it does not want to use its own brain. 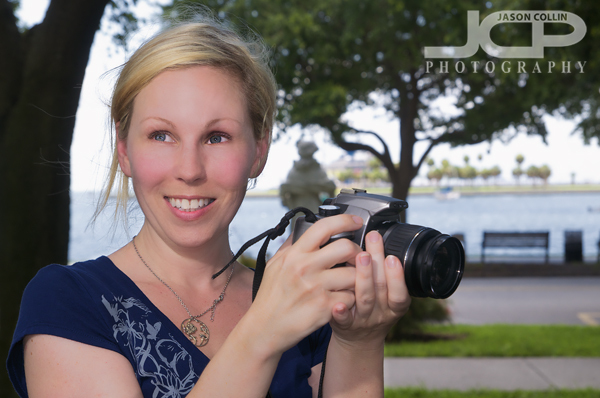 Holly and I covered a lot of ground in downtown St. Petersburg with practice in both Vinoy Park and North Straub Park. This first lesson of four was a very broad lesson showing how to do a general range of photography. Each successive lesson will be more focused on a specific photography area. My goal is to get Holly totally prepared for making great photographs indoors and out before she visits Washington DC in July.